MONDAY, Dec. 11, 2017 (HealthDay News) -- Opioid addiction often starts in the family medicine cabinet, a new study warns. If someone is taking prescription opioids for pain, such as OxyContin, it's more likely that others living in the home will also get an opioid prescription, the researchers found. "Prescription opioid use may spread within households, and patients may need to consider the risks to other family members," said lead researcher Marissa Seamans. She is a postdoctoral fellow at Johns Hopkins School of Public Health's department of mental health in Baltimore. Although the increased risk was small -- less than 1 percent -- it may be relevant across the whole population, since millions of opioids are prescribed in the United States each year, she noted. An opioid epidemic continues to wreak havoc in America. According to the U.S. Centers for Disease Control and Prevention, 91 people die from narcotic overdoses every day. Between 2000 and 2017, narcotic overdoses claimed more than 500,000 lives in the United States. Often the road to drug addiction starts with the availability of prescription opioids in the home, said Dr. Stuart Gitlow, a spokesman for the American Society of Addiction Medicine. "The first source of prescription narcotics is medicine cabinets," he said. "Family members either sell them or use them, so I am not surprised by these findings." The way to prevent access to these powerful drugs begins with doctors limiting how many pills they prescribe, Gitlow said. "It begins with physicians not prescribing month-long prescriptions for narcotics, but only the three to four days that are probably necessary, and renew it if needed," he said. Also, patients shouldn't keep unused opioids around, but return them to the drug store or dispose of them in other ways, Gitlow said. In many cases, opioids aren't even necessary, he explained. Often a non-narcotic pain pill will do the job. For example, taking Advil and Tylenol together "will do the trick in the majority of cases," Gitlow said. "Often opioids aren't necessary except in the most severe cases. A good portion of narcotic prescribing could be cut out." To see if having prescription opioids in the house influenced others to use them, Seamans and her colleagues looked at family members who shared a health insurance plan from 2000 to 2014. Specifically, the researchers looked at prescriptions for opioids given to another member of the household, beyond those of the individual who first started taking them. The researchers compared these prescriptions with those for non-opioid painkillers -- such as nonsteroidal anti-inflammatory drugs (NSAIDs, including aspirin) -- to see how many other family members got prescriptions for opioids. 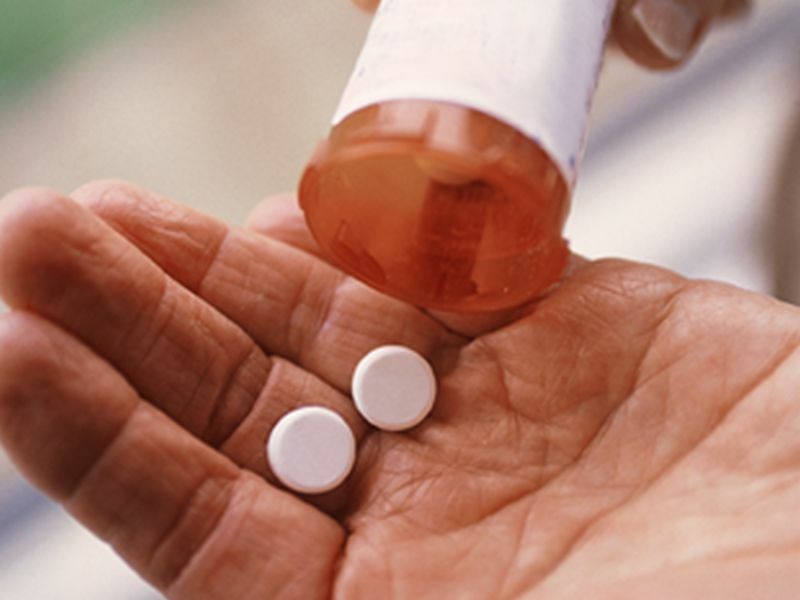 In all, nearly 13 million patients were prescribed opioids, and about 6.4 million were prescribed NSAIDs, the findings showed. Within one year, the chances of someone getting a prescription for opioids when another household member had one was 0.71 percent greater, compared with homes where NSAIDs were prescribed. Because of the design of the study, the researchers couldn't explain why other family members got prescriptions for opioids, only that they did. And they did not prove that having these powerful painkillers in the home caused others to use them and then get their own prescriptions. Although the risk of taking someone's opioids or getting a prescription of one's own is small, these drugs should be kept out of the reach of others, particularly teenagers, another addiction expert said. "If you have an opioid prescription, it's best to keep it where it's not easily accessible," said Jonathan Morgenstern, assistant vice president of addiction services at Northwell Health, in New Hyde Park, N.Y.
Morgenstern also recommends getting rid of unused opioids. The report was published online Dec. 11 in the journal JAMA Internal Medicine.